In the internet trade show display business, the act of truly serving our customers is an important function that can't be overlooked. We must understand that we are the sales professionals who are charged with the responsibility to ask questions too, and find out what the client's objectives are for the display systems they're attempting to purchase. Normally, our clients are glad to hear what we have to say about the product they're considering purchasing, which ultimately, validates their judgment too. When you call us at ShopForExhibits, you can expect our sales professionals to be knowledgeable, and to be able to advise you appropriately in the display products that you are asking about. Nothing is quite as sure as change, which is why having a trade show display supplier like Classic Exhibits has helped so many distributors weather the difficult economic times through the development of so many new high demand products. How did Classic create the right formula for success in the wake of a turbulent economy over the past 4 years? By careful observation of their own business over time. They realized that certain aluminum extrusions have significantly greater value in cost per running foot of metal than other shapes, and concluded that utilizing those particular shapes in future product development could bring great sales results in the marketplace. 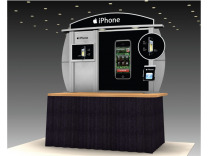 As they proceeded ahead based on good intuition and some careful planning, they've been able to introduce a whole series of successful displays that have all brought new life into the custom modular hybrid displays segment of the trade show industry. You may have heard of some of the exceptional new products that Classic Exhibits developed recently, starting with the Perfect 10 and Magellan Miracle tension fabric display systems, followed up with the Sacagawea custom modular hybrid display system. For the resellers of Classic Exhibits products, the future looks bright due to the creativity and ingenuity on Classic’s part, and some great promotion through a program they created called Exhibit Design Search. Exhibit Design Search is an internet search program for trade show exhibits which we utilize extensively on the ShopForExhibits.com web site.